TechCredo is a blog about mobile technology with focus on comprehensive guides, tutorials and articles rather than on news and frequent minor posts. Since mid 2010, TechCredo mainly deals with Google’s open-source mobile OS Android. Some of the reasons for this are detailed in the post Android and I: A Love Story. TechCredo is a comparatively small fish in the vast sea of tech blogs. As of late October 2010, it receives around 125 000 pageviews a month. TechCredo – what does the name mean? The tech prefix is naturally short for technology – Credo is Latin for “I believe”. Combine the two, and it can be interpreted as the phrase “I believe in technology”, or that this is a site with opinions about technology – both assumptions are true. The phrase “I believe” is also a reference to the X-files: one of the top shows for nerds in the 90s. Ever since I was a little kid in the 80s, I have been deeply fascinated by a certain kind of electronic gadgets. I remember that it often felt like they were surrounded by magic, and I still get that feeling now and then. It was bliss to learn everything I could about them. From the ColecoVision (it could play Atari 2600 games! ), the Commodore C64, a bunch of Donkey Kong Game & Watches, the Sega Master System, Game Gear, various early incarnations of PDAs, the Amiga, to my first PC in 1994 – I have been nurturing this interest. And now I’m just as intrigued by handsets as I was by computers 15 years ago, and smartphones are of course becoming our new personal computers. I more or less expect a mobile to be able to do all the things my PC can, in addition to being a solid camera, video recorder and GPS navigator. I know this must sound a bit odd to some people, but when I use a good smartphone (especially if it’s fairly new and there’s lots left to discover), it’s like stepping into another world. I can’t change the real world much, but this digital frontier of zeroes and ones, black metal and plastic, AMOLED screens and computer chips I can bring to perfection. A smartphone is of course a tool of communication, and if one only tries I’m sure there’s something poetic to find in that. A mobile simply is the ultimate gizmo, it has so many uses, and to me it epitomizes all that I find fascinating about gadgets. I quote science-fiction author Arthur C. Clarke: “Any sufficiently advanced technology is indistinguishable from magic”. For each new model, I’ve become more and more interested and initiated. From just having picked a handset that seemed good based on an ad in a magazine in the early 00s, to really let the selection process be a part of the interest. I love reading and learning about upcoming models, and when I get a new device, I try to discover everything about it: I find all the best apps, customize, tweak and optimize it to my liking and every need, make up my own designs, themes and wallpapers (stylish, clean and functional). I try to make it do stuff no other copy of that phone can, and make it much better than the original. And that’s what I love about the xda-developers. I have a background in programming and in designing software and websites. I founded my own computer company in 1996 right after I had started high school. In February 2009, I felt like creating a website about the frontiers of mobile technology, so that’s what I did. The site’s initial incarnation was GeekedOut.se, which I developed from scratch with HTML, PHP and CSS – it involved a lot of extra work and made maintaining and updating the content bothersome. GeekedOut.se later grew into what you see now: TechCredo.com. From the first of August 2010 until the beginning of March the following year, I worked as an editor for Androinica.com. At the time, it was one of the six largest Android blogs in the world. I left because I found a better job, writing about Android and mobile tech in my native tongue. I’ve also been a guest editor as such esteemed tech sites such as PhoneDog.com and AndroidGuys.com. 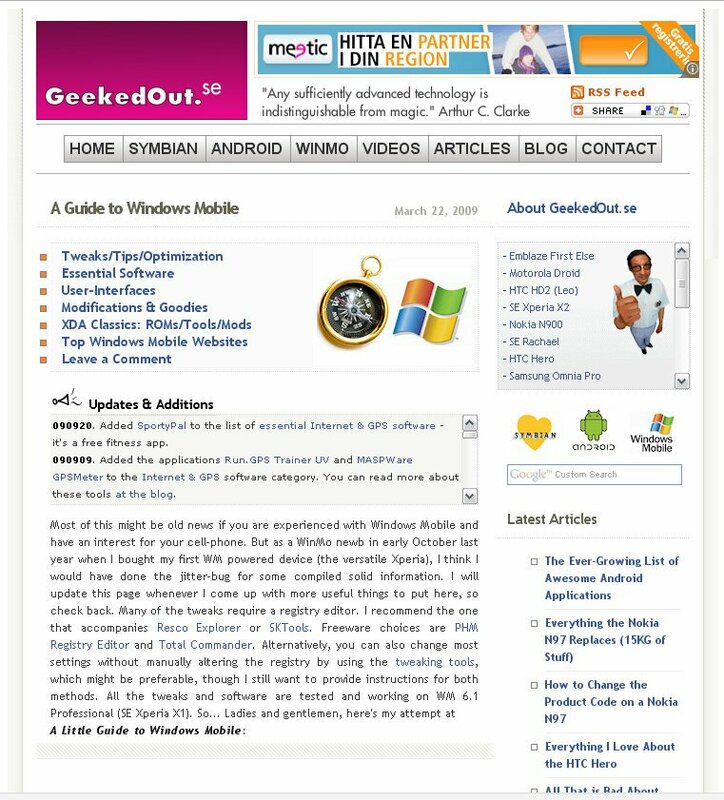 Over the years, my posts have been written about by publications such as Symbian-Guru.com (now defunct), WOMWorld/Nokia, WMPowerUser, 1800PocketPC and Swedroid. In mid November 2010 I created the site AndroidAppolo.com (that I didn’t have time to maintain) that lets visitors browse and discover the top Android apps. My latest project is Androidenheter.se – a database of Android devices in Sweden and my personal blog is called A Smooth Sea (…never made a skilled sailor). I also made “How old were the actors?” – a website that shows how old the main actors were when making a movie, how old they are now and whether or not they’re alive. I hope you enjoy TechCredo, and if you do – please spread the word. Feel free to drop me an email or leave a comment if you want to get in touch. “Terrific blog, so incredibly useful, insightful and well-written. Sincerely, thank U for taking the time to share Ur knowledge and experience: U’ve really helped me to make the most of my phone. Honestly, it’s the piece of writing I could never write myself – I’d lose it at about 25% and from then on it’d be nothing but a personal rant, cursing even the footprints of every single freakin’ crApple-fanboy/-girl. But you, I think, managed to sum up all that’s wrong with crApple and everything that makes it so freakin’ hateful. “Wow! Thx man you are amazing and very professional! You made my day with this guide and have got my N97 on a totally different level with my best games of all time! “Great tips and have followed them all. thanks heaps!